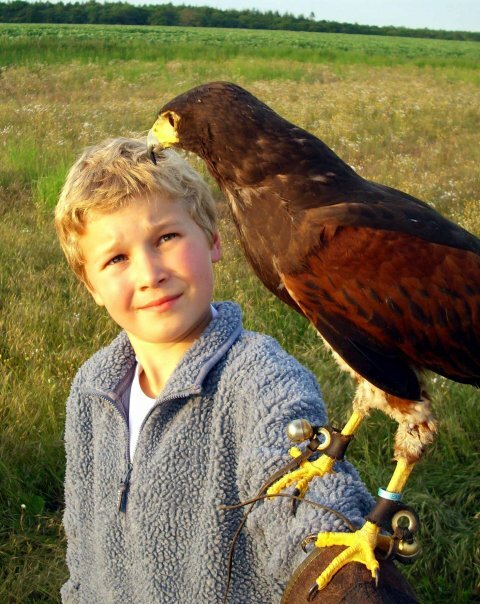 Spend a morning or afternoon in our local countryside with Billy our Harris Hawk, as we walk across the fields. Billy will follow on from tree to tree and you will experience the thrill of calling him to the gloved hand. Billy is a trained hunting bird, so during the hunting season you may be lucky enough to watch him chase and catch his own supper! We are also training Farley our young Buzzard who will also be coming out with us this year. He is not as fast as Billy, but likes to fly to the glove and do things the easy way... most of the time. If this is to strenuous for you, enjoy flying Kai our beautiful male Kestrel; he is very, very fast and loves being with people. Whatever your choice, we are sure you will enjoy being in the company of these wonderful creatures and have the chance to see them close up too. Please contact us for more information, or to arrange a Hawk Walk.